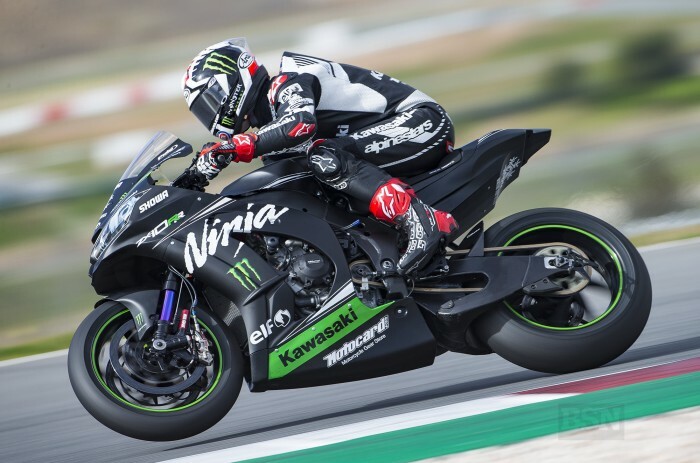 Reigning champion Jonathan Rea took his latest spec Kawasaki to the top of the testing times in what is the final European track outing for the WorldSBK grid before the build up to the first round in Australia, in late February. Rea finished with a 1’40.855 lap but was then spat off unhurt at turn four. Alex Lowes (Pata Yamaha) was again second fastest with a 1’41.814. Rea’s final advantage was almost a second over the Yamaha rider in what were again incredibly windy conditions. Light rain threatened to stop play with two hours to go but it came to little and the bulk of the field took to the field to make their last adjustments and fast laps before the end of the European testing season. Alvaro Bautista (Aruba.it Racing Ducati) was finally third quickest, upping his pace late in the day. Leon Haslam (KRT) posted the fourth best time of all and Michael van der Mark (Pata Yamaha) ended up fifth on the second works R1. After a particularly strong first day Tom Sykes (BMW Motorrad) ended up sixth fastest, his time today almost 1.4 seconds from the incredible pace of Rea. The GRT Yamaha duo of Cortese and Melandri placed seventh and eighth fastest, respectively. Toprak Razgatlioglu (Kawasaki Puccetti Racing) did not resort to qualifying tyres and as a result dropped back from his day one top four status to ninth. Markus Reiterberger (BMW Motorrad) ended up tenth fastest on the day that the team’s new white, red and blue livery was unveiled. Chaz Davies (Aruba.it Ducati) was 11th today and Eugene Laverty (GO Eleven) 13th, still needing work to be done on the settings of his rear suspension.